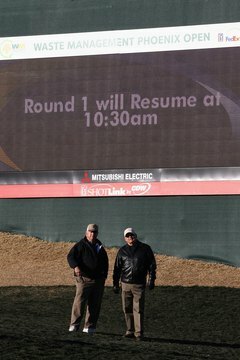 Spectators wait out a frost delay during the 2011 Waste Management Phoenix Open. If there’s one phrase a golfer with an early tee time doesn’t want to hear, it’s “frost delay.” After all, any golfer willing to tee it up when it’s cold enough for frost to form is probably an avid player who may only be able to play in the morning. While some groundskeepers may try to speed up the melting process by spraying warm water on the grass, many others rely on Mother Nature to melt the frost, which results in an unpredictable delay. Frost is a form of ice and can only survive at temperatures of 32 degrees Fahrenheit and below. But that doesn’t mean the measured air temperature must be 32 or below for frost to form on a surface. Green grass, for example, absorbs sunlight and heat during the day, then loses heat when the sun goes down, so the grass’s temperature may be lower than the surrounding air temperature. This temperature differential causes moisture to condense on the grass during the night. If the temperature of the grass then falls below freezing, the moisture may crystallize into frost. This can occur even when the nearby air temperature is in the upper 30s, particularly when the air is calm. Frost may occur overnight, but it often forms at sunrise, before the temperature begins to rise. Frost formation on grass is possible in any location in which the blades’ temperature falls to 32 or below, including warm weather states such as Florida, California and Arizona. For example, overnight frost may form on an Arizona course on days when the high temperature reaches 70. Frost itself doesn’t damage grass in the way that it may damage other growing things, such as citrus fruit. However, golfers walking on frosty turf may harm the grass quite badly. Because the grass on putting greens is cut so low, around 1/8 inch, it is particularly vulnerable to damage when it’s covered by frost. When a golfer walks on frost-covered grass it is more likely than normal to break and suffer ruptured cell walls.